STAR bond district approved for American Royal project – Welcome to Wyandotte Daily! A Unified Government map showed the extent of the American Royal STAR bond district. State and local sales taxes from 110th to 118th, between State and Parallel, will go to the new district. In the Piper Plaza and Plaza at the Speedway area, only state sales taxes will go to the project. The Unified Government Commission voted unanimously Thursday night to approve a STAR bond district for the American Royal project. STAR (sales tax revenue) bonds will use sales tax revenues within the district for building the $160 million project. The STAR bond district generally ranges from 110th to 118th, from State Avenue to Parallel Parkway, in an area to the west of The Legends, according to George Brajkovic, economic development director. There is a little more property included west on State Avenue. Not included in the district are a church and also some apartment buildings. An additional STAR bond district area is in Piper Plaza and Plaza at the Speedway, to the north of The Legends, but that portion of the district is only for state sales tax revenues. Local sales tax revenues at Plaza at the Speedway and Piper Plaza will continue to go to the local governments. 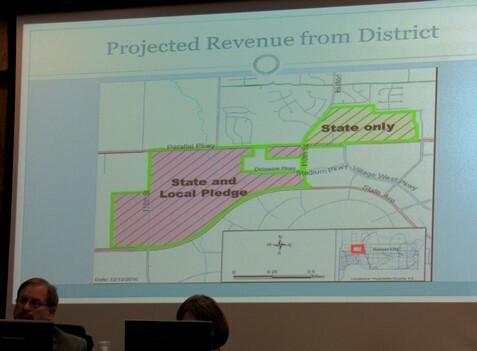 The STAR bond district area was changed to remove the Target and J.C. Penney area from the district, according to Brajkovic, but leaves the other parts of the proposed district in place. The Target and J.C. Penney area was part of the original STAR bond area but bonds were never issued there, and it was also part of the overlay area for the National Training Center project nearby, but no bonds were issued there, he said. There were changes in language in legislation last summer regarding land that had been included, he said. Brajkovic said the UG is open for negotiations for both state and local sales taxes to be used for the main area of STAR bond district, which is the new ground in the project. It is up to the state if it wants to pledge the state revenues from sales taxes at Speedway at the Plaza and Piper Plaza into the new American Royal project, he said. The UG is not, however, open to including any local revenue pledge from existing businesses at Plaza at the Speedway and Piper Plaza back into the project, he added. The area west of 110th Street, more than 400 acres of farm land, currently produces $25,000 in annual property taxes and no sales taxes, he said. The overlay district, Plaza at the Speedway and Piper Plaza, currently produces $148 million in annual sales, $76 million in appraised value and $3.15 million in annual property taxes, he said. The UG would like those local dollars to stay local, he added. According to Brajkovic, a development plan and development agreement for the American Royal project will be brought forward in the future, probably within a year. Korb Maxwell, an attorney representing the American Royal, said they have been working behind the scenes on the project for a number of years, and are excited to locate in Wyandotte County. “We see this now as one of those first steps, getting the STAR bond district created,” Maxwell said. Going through zoning, land use, and planning and working on the development agreement are other steps. He said this will be a public-private partnership, but different from most projects in that there is no profit motive. Private participation will all be charitable contributions to be raised and brought into the county from some of the biggest donors in the region, he said. “We’re excited to move forward on this with your approval,” he said. The commission’s vote followed a public hearing. A man spoke at the public hearing, whose wife’s family owned 3 acres west of 118th Street. He wondered if there was development planned west of 118th, if this project would change the property values there, and if any property would be seized by eminent domain. He said they were excited to hear the American Royal was coming to the area. Maxwell said the American Royal was negotiating for land within the STAR bond district outlined at the meeting. One of the other landowners had executed a letter of intent just hours before Thursday’s meeting for about 65 acres on the east side of 118th, he said. The American Royal also is working with them and discussing options for 40 acres on the west side of 118th, he said, but so far has come to no final agreement on that 40 acres. The approximate size of the American Royal project is around 65 to 100 acres, he said. Maxwell said there is no ability to do eminent domain any more for a private project, and the American Royal is not looking at it. As far as property values are concerned, the American Royal would likely be tax-exempt as a not-for-profit, and he thought it would have little effect on smaller parcels nearby. UG Administrator Doug Bach said there may be some effect on property values in the area. Village West has changed the value of nearby property a great deal, but typically there is not a lot of change unless a lot more property sells right around it, he said. If the three acres is zoned agricultural, it would stay at that zoning, he added. Eminent domain could be used only if the UG needs property for streets and public projects, such as expanding 118th Street, he said. Mayor Mark Holland said eminent domain was allowed during the Kansas Speedway development but no longer is allowed to be used for private developments. Eminent domain can be used by the community for roads, sewers, schools and parks, he said. Commissioner Hal Walker asked why doesn’t the UG extend the STAR bond district on the west side all the way to Parallel Parkway. “We’re not going to get another shot at this property to include it,” he said. He said development will proceed westward and Parallel and State will be the conduits of it. Putting the property in a STAR bond district doesn’t require the UG to buy it or do anything with it, he added. Brajkovic said the STAR bond project is a work in progress and still can be changed. He said the UG staff thought it was more of a residential zone toward the north, and might not add anything to a sales tax district. According to an attorney for the UG, they would have to start the notification process over again to add property to the STAR bond district, although there would be no notice required if they subtracted property from it. Besides sending notices to the property owners, the UG also did a finding of eligibility of the area from the secretary of commerce, under the statutory requirements of the project, Brajkovic said. “STAR bonds are one of the most powerful economic development tools in the country, and there’s communities all over the country who would love to have the power of the STAR bonds,” Mayor Holland said. “Anywhere we can do STAR bonds, we should do STAR bonds,” he said. In the current STAR bond issue that has just been paid off, there was no public money used to back the bonds. The projects paid for the bonds entirely. About $450 million was invested in STAR bonds in the Village West area, that leveraged $1.5 billion in additional private investment, he said, totaling a $2 billion investment. Of the $450 million in sales taxes used at Village West, $150 million was from Wyandotte County and Kansas City, Kan., while the other $300 million was from the state of Kansas, he said. The sales tax is two-thirds state and a third local. The power of the STAR bonds is it’s two-thirds state money because it gives the community such economic leverage, he said. No public funds were used to back the $450 million in STAR bonds that were paid off, and only $150 million were local, paying dividends for the community over and over, he said. Bach offered a summary of the Village West development project, where the bonds were paid off earlier this month. He said 20 years ago, there was little development in the Village West area. The Kansas Speedway was developed in 2001, with other developments coming later. In 2006, The Legends opened most phases, and Piper Plaza opened to the north. In 2008, Target and J.C. Penney were added to the west. Schlitterbahn was developed in 2010, and Plaza at the Speedway and Walmart were added. Piper Plaza and additional developments then arrived. In 2012, Kohl’s was added and Sporting Park was built near Nebraska Furniture Mart. An auto dealership was developed north of Parallel. In 2014, another auto dealership was added , the Cerner campus was built in the southern part of Village West, and Village West Apartments developed west of 110th Street. Now there is another phase of the apartments, and there is also a Dairy Farmers of America campus almost complete. Bach said there have been $650 million in sales that came from the Village West area, including $12 million in new annual sales tax revenue to the UG. There is also $42 million to the state of Kansas as a result of this project after the payoff of the bonds. There has been more than $2 billion invested in the Village West area, he said. The western I-435 area has produced more than $22 million in annual property tax, with $12 million from Village West, he said. Before development, it was producing $300,000 in property tax. The western I-435 area also has created 11,000 new jobs, he said, including 5,700 at Village West, 3,000 at the Cerner campus, 700 at Hollywood Casino and more than 300 at the Dairy Farmers of America. The UG also approved an ordinance for tax abatement and payment in lieu of taxes for the U.S. National Training Center project near 98th and Parallel Parkway, and also a resolution of intent to issue $90 million in industrial revenue bonds for the project. Brajkovic said the UG previously adopted a resolution to approve the project and development agreement, and a resolution for $83.2 million in IRBs for sales tax exemption only. In the development agreement was a provision that the National Training Center and youth tournament fields would be tax exempt, he said. Either the ownership entity would qualify for an exemption through the Board of Tax Appeals or through the use of IRBs for a 10-year term, he said. The UG owns the ground where the youth tournament fields are located, he said, and the UG applied for a tax exemption with BOTA and was granted it, he said. For the training center, the developer will pursue the IRB route, he said. The National Training Center is just east of 98th and Parallel, and the youth tournament fields are located west of 91st between State and Parallel. The IRB includes a 100 percent tax abatement, as approved in the earlier development agreement, he said. The youth tournament fields will have an annual payment in lieu of taxes of $50,000, with a 10-year term totaling $500,000. The National Training Center will include an area for the training center, and a Children’s Mercy clinic associated with the project. So far, the ground has been graded, and some foundations have been poured for the NTC building, he said. The tournament plans include 12 fields, and should be completed by fall of next year, he said. There will be eight synthetic fields and four natural grass fields. “We’ve always contemplated the use of IRBs,” Brajkovic said. The 10-year PILOT structure is what is new in this phase of the project. Marcia Rupp, a Kansas City, Kan., resident, spoke in favor of the project at a public hearing. “I’m interested in revenue here. Let’s not let the people being trained, these athletes, and go to Johnson County and buy all their gear – socks, shoes, shorts, shirts – let’s have a big sports store out there,” she said. In other action, the commission approved additional funding for the new South Patrol police station. An increase of $313,000 was approved, added to the original $2.24 million cost of the project. According to UG officials, the additional funding will revitalize the property where the station is being built. The funding will be moved from the police department’s savings in inmate jail expenses that are paid to the sheriff’s department, UG officials stated.